This was a tough race, coming just 7 days after a hard run at the Great Eastern Run; the legs definitely weren’t at 100% and far from race ready, but a race is a race and you can’t go into these things without a positive ‘out to win’ attitude. However, with the race incorporating both The Cambridgeshire County Championships and The Eastern Masters Championships for the 10 mile distance, I felt I had to give it a shot. I was confident that I had enough left in my legs and the mental strength to come away with some form of Silverware from the race. I went out with the lead pack and was feeling pretty comfortable in 3rd place for the first couple of miles, running at my planned race pace of 5:35 a mile. However, going into mile 3, I began to feel last weekend’s race in my legs and began to drop to 5:40 pace, but I was still holding on to 3rd place. As the miles passed, the legs were tiring and felt heavier and heavier and, by mile 7, I had dropped down to 5th place overall and was really suffering. I knew that despite my overall position, I was still on for a Silver medal in both the Eastern Masters Championships and The County Championships and knew that I just had to dig in to secure this. I gritted my teeth and despite the heaviness in my legs, I managed to pick up the pace for the last couple of miles and, although I was reeling in the runners in front, I ended up finishing in 5th place. 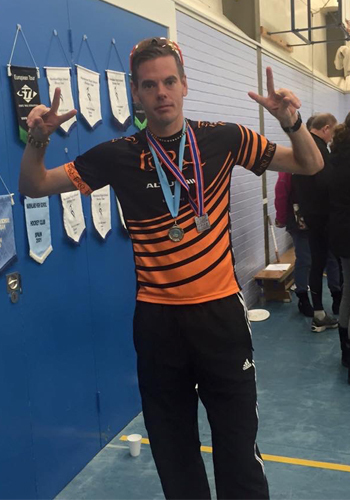 So although a little disappointed about not finishing on the podium in the overall race, which I knew I was capable of, on top form, I was pretty happy that the result was enough to give me 2nd place in The Eastern Masters Championships and also 2nd place in The Cambridgeshire County Championships. This was my first County medal, so a nice one for the collection. So, despite beating myself up a little about not performing at my best, I can’t be too despondent with the morning’s work and will now turn my focus to the British Masters Marathon Championships in Newcastle on the 1st of November. 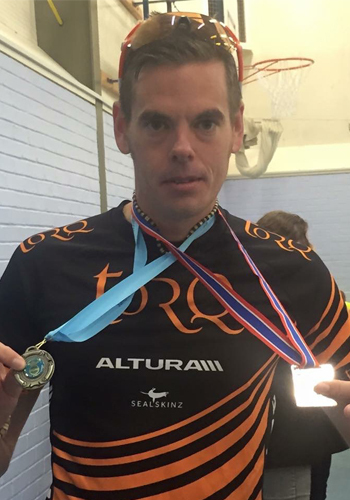 As I waited for the medal ceremony, I sipped my favourite TORQ Banana and Mango Recovery Shake to speed up the recovery process and to start getting the legs marathon ready.